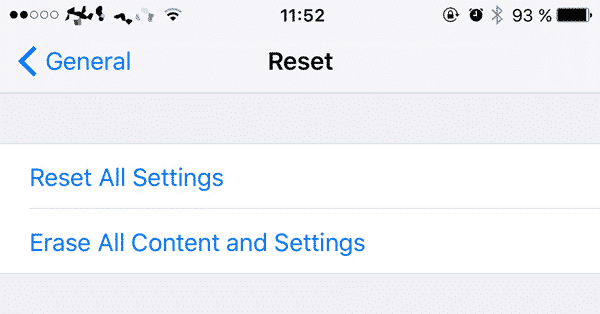 How to Reset any iPhone & iPad to Factory Settings in 1 Min. What do passwords, in-app data, emails, videos, photos, and information-sensitive memos have in common? Believe it or not, they’re all stored by everyday iPhone or iPad users in their device. What’s worse, is these users are handing over the potential identity theft data to strangers or even after selling the iPhone or iPad without resetting it. So if you’re planning on selling your iOS device, it’s a damn good idea to get rid of all personal info before handing it over. Luckily, removing all data from your iPhone and iPad can be done in a few clicks by performing a factory reset and we’re gonna show you how. 1. Go to Settings and scroll down until you find a “Reset” tab. You will be presented with a few options of what you can reset, such as keyboard dictionary or home screen layout. To bring your iPhone back to its factory default settings, tap on “Erase All Content and Settings” and then on “Erase iPhone”. If a Passcode or a Restrictions Passcode is set, you will be asked to enter it before being able to reset your device. After you enter the Passcode you will be asked for your Apple ID password. Enter it to begin erasing all data from your device. Open iTunes. To prevent any potential obstacles during reset, make sure that your iTunes version is up to date – simply click on the ‘check for updates’ in the drop-down menu. Connect your iPhone to your computer. If yo’d like to keep some files, you can do a backup by clicking “Back Up Now”. If you just want to delete everything without saving it first, you can skip the backup. Click on the “Restore iPhone” option in iTunes and confirm your decision by clicking “Agree”. If you ever change your mind and decide that you would like to get the data back on your phone, click “Restore from Backup…”. Plug the USB cable to your PC but don’t plug your iPhone/iPad just yet. Don’t start iTunes either. Plug the USB cable to your iPad or iPhone while holding the “Home” button to turn the device on. Click the “Erase iPhone” (or iPad if you are resetting your tablet) option available in your device’s information box. You’ll be asked to confirm your decision. After that, the reset will start. If the device is offline, it will begin as soon as the device becomes online. Keep in mind that if you have “Family Sharing” setting set up, you can reset your family members’ devices back to their factory default too. When resetting an iOS device, you will be asked to enter a phone number and a message which is then shown on screen after the reset is completed. Do you know any other methods of factory resetting your phones or restoring your data in a quick and easy way? Don’t forget to share them in the comments below!